Passed away 31 March 2019 aged 41 years, after a courageous fight with Leukaemia. Darling daughter of Janet and Frank. Cherished sister of Monique, sister-in-law of Mark. 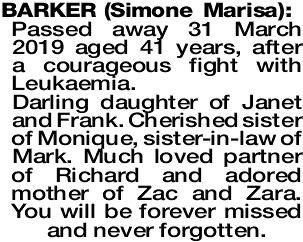 Much loved partner of Richard and adored mother of Zac and Zara. You will be forever missed and never forgotten. The Funeral Cortege for Simone Barker of West Leederville, will arrive at the main entrance of KARRAKATTA Cemetery, Railway Road, Karrakatta at 12.30pm on TUESDAY (9.04.2019) for a Cremation Service. 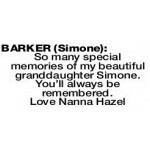 BARKER SIMONE So many special memories of my beautiful granddaughter Simone. You'll always be remembered. 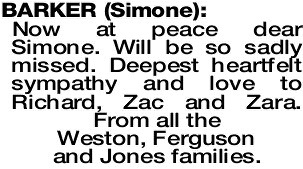 Now at peace dear Simone. Will be so sadly missed. Deepest heartfelt sympathy and love to Richard, Zac and Zara. From all the Weston, Ferguson and Jones families. 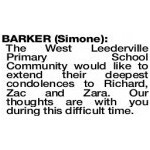 BARKER SIMONE The West Leederville Primary School Community would like to extend their deepest condolences to Richard, Zac and Zara. Our thoughts are with you during this difficult time. 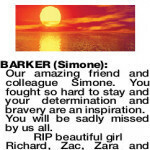 BARKER SIMONE Our amazing friend and colleague Simone. You fought so hard to stay and your determination and bravery are an inspiration. You will be sadly missed by us all. 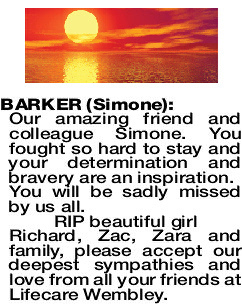 RIP beautiful girl Richard, Zac, Zara and family, please accept our deepest sympathies and love from all your friends at Lifecare Wembley.